Horse-riding is a common sport that people enjoy and it is popular in most parts of the world. For some, it is a seasonal sport which people enjoy during vacations or picnics. This includes people who do horse-riding for leisure as well as others who do it less frequently as a pass time. However, for some, this is a very competitive sport that, like other sports, is a profession for them and they take it very seriously. Competitions and tournaments are a serious matter and are usually preceded by tough training routines. There are different types of horse ridings in different parts of the world. The most common are the English way of riding and the western way of riding. There are some differences between the two as we shall now see. English riding is one of the most popular horse riding. There are various sub-types within English riding but the presence of a flat English saddle is common to all. The saddle is without a deep seat, a high cantle or a saddle horn. Moreover, knee pads are also absent which would otherwise be present on an Australian Stock Saddle. What is unique about the saddles in the English way of riding is the design of the saddles; they are all designed in such a way that they allow the horse sufficient freedom to move in an easy manner. They also allow certain types of movements that are essential for tasks such as classical dressage, horse riding etc. Moving on, the English bridles come in various styles on the basis of the discipline but once again there is something common to all. Most of them have some type of noseband and sometimes closed reins which are buckled together at the end. This ensures that they do not fall to the ground even if a rider gets unseated. In addition to this, the clothing that riders use in competitions of English riding are based on old traditions and have different styles but require a standard as a minimum requirement; boots, jodhpurs or breeches, a shirt together with a tie or a stock, a cap, hat, or a helmet, and a jacket. In contrast to English riding, the western riding evolved from warfare and ranching traditions that were brought to the Americas by Spanish Conquistadors. As time passed by, the equipment as well as riding style evolved to meet the requirements of a typical cowboy in western America. Western horses were specially trained to neck rein, that is, to be able to change direction with light pressure of the rein against the neck of the horse. This was done because the cowboys needed to use a lariat with one hand and had just one hand free for controlling the horse, so something had to be done to ensure that the horses could be handled with one hand. Furthermore, horses were provided training so as to make them able to use their natural instincts and have some decision making in moving; the aim was to excise a degree of independence and make the horses responsive to the slightest of rein contact. The saddle used in western riding, unlike English riding, has a deep seat and/or high cantle and saddle horn. Knee pads are also sometimes present although not always. In addition to this, the attire of western riding consists of denim jeans, boots and a long sleeved shirt. A cowboy hat that is wide brimmed is also used. allana. 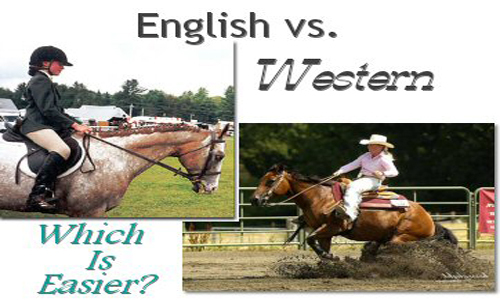 "Difference between English and Western riding." DifferenceBetween.net. January 14, 2015 < http://www.differencebetween.net/miscellaneous/sports-miscellaneous/difference-between-english-and-western-riding/ >.